Ever feel like life is one crisis after another? Does watching the evening news make you anxious and fearful? Ever wish things would just settle down and stay static for a while? I know I do but I don’t think it’s going to happen anytime soon. In fact, it seems like things are coming at us at even faster speeds. The crises we face in life are opportunities to see how we react and to test and grow our character. The difficult part is most of the time we are blind-sided by these events: an unexpected death or illness, a financial loss, a relationship shatters. Then what? If we have not strengthened our spiritual muscle, we are in for a rough time. So today, I’m going to share with you the importance of strengthening your spiritual muscle. Didn’t know you had one? Then read on. In the same way athletes strengthen their physical muscles for more intense workouts, we too must train our spiritual muscle for the ever-increasing challenges life presents. Deep within each of us lies a seed. This seed is the birthplace of our greatest power. It is our secret weapon against the trials and tribulations of life. It is the key to keeping our joy and our peace despite difficult circumstances. It is crucial to maintaining hope in the midst of great loss or disappointment. Without a strong spiritual muscle, we are tossed to and fro in the tsunamis of life’s sudden difficulties. We moan and groan. We get depressed. We lose hope and we lose faith. There will always be difficult circumstances to deal with but we can prepare ourselves to handle them in a much more positive way. I was having dinner with an old friend last night who had recently married. As she shared all the joys of marriage, she also shared how her health had deteriorated and how she is in much pain. I felt so badly for her. As a ballroom dancer for many years, she has always been active and now she can barely walk without pain. Yet her conversation was full of joy and hope and she focused on all the blessings in her life and her upcoming travels. That my friends, is what a spiritual muscle does for you. It’s about focusing on the good things in our lives, rather than the negatives. It’s about realizing we all go through storms, but the storms will pass and there will be blue skies once again. It’s about knowing there is a loving and caring God who understands the suffering we go through. It’s about looking forward into the future with hope and anticipation despite the current obstacles. Faith is the positive belief of things not yet seen. Faith says not only do I believe God can get me through his, I believe He will get me through this. Faith is what Winston Churchill instilled in his famous speech when he said “Never, never give up!” Every trial we go through is an opportunity to learn more about ourselves, others, and God. It gives God a chance to prove His faithfulness to us. It gives us a chance to see God move in our lives. It really is quite an amazing thing to encounter. As a single divorced mom, I was faced with many difficult circumstances. I dealt with addictions, financial disaster, depression and anxiety, the effects of being raised in an alcoholic home as well as an emotionally abusive and unavailable spouse. I know what it’s like to face major challenges unprepared, so I want to encourage you to take steps today to strengthen your secret weapon so you will be better equipped to face the inevitable crises that will arise in your life. The storms will rage all around us, but we do not have to allow ourselves to be continuously tossed about. 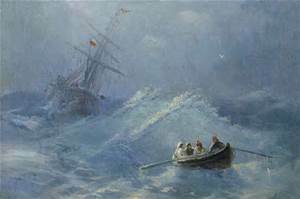 We can remain anchored and steady, knowing the storms are sent for our ultimate good. What storm or challenge are you facing today? Are you sinking in the depths of despair and lost hope? If so, take heart. You will get through it and you will be stronger for it. If this post encouraged you, please click the +1 Google icon, leave a comment, or forward to a friend who may need some encouragement.